Brandon Quan a California Native has been a bass fisherman most of his life and so has his father and grandfather. All of this experience has made him one of the best recreational fishermen I know and I got the pleasure of catching up and picking his brain on bass fishing. I asked him what he thinks are the most important things for new fishermen to master to help them get started and we agreed on a a lot and he also brought up other points that made sense. When I asked him what to learn first in fishing he said knots, he went to explain the different knots you want to learn and master them so you can tie them quick. He said that if you are good at them you are more comfortable to tie on new baits and in turn fish the waters better. He brought up that the first bait to master is the drop shot because you can fish it anywhere and anytime time so you can have fun catching fish and find the fish. He wanted to emphasize that just cause you master fishing that or a different lure do not rely on it to get better you need to push out of your comfort zone and try to fish baits you have not used or are not confident at. Tight lines! Anderson Lake located in Morgan Hill, California is the largest lake in Santa Clara County and is one of my favorite lakes to rip lips on. This lakes is one of the most consist producers of bass I have fished and is very predictable. I fish two baits almost exclusively when I am on the water, A spinner bait and a drop shot. Despite it being such a large lake I spend almost all of my time fishing “rattle snake cove” (seen on map by boat launch) a cove directly across from the boat launch. I suggest starting there with a drop shot when the wind is low in the morning and just work every little inlet in the cove. When you have done that go back to the mouth of the cove and do it again. The wind tends to pick up strong in the afternoon at which point switch to the spinner bait and repeat. On summer afternoons the wind picks up and so does the wake board traffic. The wind and wake boarders are the two cons of the lake. The wind make it hard to navigate a boat and hard to cast in your intended location. The wake boarders although are not allowed to make wake in “rattle snake cove” tend to like to come take breaks in the cove. When they do lots of them play their music loud, sit where you want to fish and in general make fishing difficult and frustrating. Weather the cove is not producing or you have had enough of the wake boarders there are a few other spots you can try. There is an adjacent cove that is smaller and does not hold as many fish but can still make a bad day fishing a good one. When times are tough the dam is a worthy try but you will need to switch to a jig or a deep diving crankbait. Overall I would give the lake a 8/10 and suggest every angler to give it a try if given the opportunity. In our large state of California we have lakes and streams of all sizes and “colors” or clarity rather. You have bodies of water like Clear Lake which despite it’s name is actually a pretty murky lake to lakes like Berryessa where you can see sometimes over ten feet. When fishing soft plastics like worms, plastics shads and creature baits you need to choose the right color of it to ensure you are catching the most fish possible for the day. Choosing the right color is fairly counter intuitive a rule of thumb the “darker” murkier water use darker plastics and visa versa. So for example if the water is really muddied up and you can barely see you bait the instant you put it in the water you should be fishing a dark bait like a black or dark green. I do not know the exact science behind why this is because when I started fishing I figured in that scenario you should throw something like neon or white because for humans that is the easiest to see. But something about Largemouth Bass and their vision find darker colors easier in murky water. It is also important to understand that water clarity changes in the same body of water as fast as 15 minutes, all it takes are a bunch of boats creating wakes to muddy up the water and change the color of bait the fish are biting on. Algae blooms, wind, rain, etc. can all change the clarity of the water so it is important to not rely on colors that have had success before but rather the conditions that day. That being said you might find patterns for certain bodies of water for types of conditions that work better than others for no explanation. For example the fish in a certain lake might like a purple strip in the baits, but this is something that just takes catching a a lot of fish in a body of water to figure that out. If you go into any sporting goods store or tackle shop you will notice almost a whole isle donated to just fishing line varying in price from around $5 to some upwards of $60 so I am going to help you pick the right line/ lines for you. The first thing one needs to know are there are three basic types of lines monofilament, fluorocarbon and braid and all have there ups and downs. To start monofilament is what most anglers have for all types of fishing from freshwater trout to saltwater cod and is good because it is CHEAP. Monofilament is the line with the 5,6,8 dollar price tags which make it tempting but it frays easily and is stretchy which can take away force when setting the hook. Fluorocarbon is similar to monofilament in looks but has no stretch and the way light reacts with it underwater it is virtually invisible. Braid is the strongest for its diameter and gives you the most feel of what you are hitting under water but is the most easily visible. Now if I could only choose one to fish on all my poles I would choose…. fluorocarbon and braid?!?! Now to do this I would spool my reel with braid and using the double unison (double uni) tie on a 6 foot liter to the end which I would tie my lures on to. Doing this I get the best of both worlds, the feel of the braid and the invisibility of the fluorocarbon and a bonus the amount of line on your reel does not get shorter as you have to retie new lures. The other thing you need to consider is the proper test line (strength) which changes the flexibility and diameter of the line so you need to choose one strong enough but not over kill. I suggest between 10 lb and 12 lb for whatever you are connecting onto your lure but if you use the double uni I was talking about I would make the braid on your spool 30 lb because it is easier to tie knots and ensures a break on a snag will only be on the last 6 feet of your line. Bass fishing is a very dynamic sport one thing will work great one day and you will get skunked (catch nothing) the next and as winter inches closer fishing gets more difficult. Even though here in California we have fairly mild winters across the state the fish still make dramatic changes in the way they act and react to baits. Just like us in the winter the fish tend to be more lethargic and like to stay warm so it limits the fishing you can do. 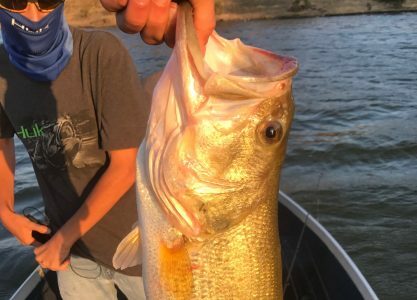 Around October the water temperatures begin to drop dramatically Large Mouth Bass will begin to retreat to deep waters where the water temperature will stay warmer and more constant. In the winter Bass are similar to bears, bears hibernate and bass try to use as little energy and wait till the spring to go on the hunt for food. Because of this fishing for them becomes almost impossible especially if you do not have a boat and fish finder. The best way to catch fish in the winter is to use a football head jig and move it super slowly gently bouncing it off the bottom in deep waters. The fish at this time of the year do not want to come out and attack lures like they do in the spring and summer so you are going to need to drag the bait right in front of them to coax them to sucking it up. If you are fishing from a bank or even on a boat it is going to be hard to get lucky to have a real chance of catching winter fish consistently. Your best bet is if you have a fish finder because it will show you where the fish are hiding deep and where underwater cover like downed trees and rocks where the fish will hangout. No matter what winter fishing will be vary slow compared to the other seasons so stick in there and try not to get discouraged! The drop shot is a crucial set up to know how to properly execute to be a successful and dynamic fishing especially in California. The drop shot is a lure set up associated with “West Coast Anglers” and are used by professionals and novices alike in states on the west of the United States especially California and Arizona, used for Largemouth Bass, Smallmouth Bass and even Spotted Bass. Chris Zaldain a San Jose, Ca local and Professional fisherman in the Bassmaster Classic series on of the biggest bass fishing tournament series in the United States placed 6th in the Ca Delta tournament using it almost exclusively. The set of of a drop shot is much different than other fishing lure set ups, you connect a weight designed for it at the bottom then 4″ to 12″ above you connect a 2 o/t hook, most all lure set ups have the weight above. Then on your hook you want to connect a soft plastic (rubber) either a trick worm or small shad (bait fish) imitation. Choosing being the shad or the worm will depend on what bait is in the body of the water you are fishing but when it doubt a worm is always a safe bet. The best part of the drop shot is you can essentially anywhere, rocky to weedy, 3 feet of water to 50 feet of water, etc. To fish it you want to cast it at a point that you think will be holding a fish like a point off a cove or downed tree and let it sink to the bottom. Then you want to reel up almost all the slack, then you move the rod tip up and down which will in turn make the worm “dance” underwater attracting the fish. Then you will feel a tug or two when a fishing bites it at which point yank up on the rod to set the hook and reel you fish in. When reeling in your fish keep the rod tip down and the line taught to insure the fish cannot spit the hook up. If you do not get a bite in about a minute of jerking your lure reel it up cast in a new position and try again until you have success. I suggest using the drop shot to find fish or on a slow day when you are not having success on other lures. Tight lines and good luck!